A lot to cover from this week! Last weekend I started the update with “… this upcoming week will be like riding a wild horse. It appears, the winds have finally calmed and the jet stream has moved away … Hold on tight, its summit season!” Well was it ever! There were summits every day of the week and it looks like it may keep going until the base camps are empty or the monsoons begin, whichever comes first. But as everyone who follows Everest knows, its the weather that has the last say and it bears a close eye today. By my reckoning, there are now close to 500 summits combined from both sides, not a record year but will be in the top four or five. I’ve been on or writing about Everest since 2002 – 16 years now and can’t remember a week like we just had – summits every day, mostly good weather and tragically, but realistically, two deaths. By now the typical season has had a few bad summit weather days where teams turned around primarily due to high winds. There have been several deaths, usually on the Nepal side of inexperienced climbers and unqualified “guides”or bargain guides, which was the case this week for both deaths. Also, individuals, once back from their summit push, have posted comments about crowds, slow climbers and the like, but we’ve seen little of that this year – even though it certainly has happened. This season is going perfectly in many respects – on both sides. The ropes were in at a decent time that lined up with the acclimatization rotations. In other words, teams were ready as the ropes reached the summit. That timing along with this past week of good weather allowed teams to spread out and not bunch into a few days like in 2012 when there were less than five good days the entire season. We’ve already seen summits on eight separate days thus far in 2018. It’s been interesting watching the “summit strategies” of the teams. The old guard has waited and is either going this weekend or summited late this past week. Some of the younger companies were the first to push. Usually its warmer with less wind around the 19th to 21st of May so it pays to go “later.” This year, I’m not sure it made all that much difference, however teams did report cold temps earlier in the week as in -20F/29C, some said it was -40C! If the weather continues to hold, we could see an unprecedented series of summits days unfold. Teams are targeting daily summits up to the 25th of May. If that occurs, 2018 would have seen almost two weeks of daily summits – simply amazing. But not to paint too rosy of a picture, there have been issues this season from failing oxygen systems to preventable deaths. Michael tells me that the best source for tracking these storms is from the US Navy Joint Typhoon Warning Center. This is the latest map showing a developing system off the coast of Africa that might travel east into the Bay of Bengal, just as Michael described. I’m not a meteorologist or even play one on TV, but this bears watching as it could be the season ender as we move towards the end of May. Adrian Ballinger’s Alpenglow, team of 16 people experienced the nightmare scenario on 16 May. 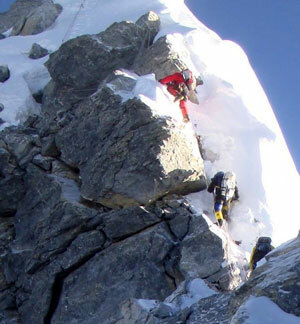 They were at 27,887’/8,500, only 3,766’/1,148m below the summit, near the 2nd Step on the Tibet side when 10 of 39 oxygen bottle regulators spontaneously failed over a 3 hour period. They were not the only team to see this phenomenon. Also on the Tibet side, Furtenbach and Transcend had regulator failures and on the Nepal side both Adventure Consultants and Kenton Cool’s member Ben Fogel had issues. All the teams were able to salvage their summits by using spare regulators except for Alpenglow who was forced back by the sheer numbers. All individuals are safe and a few are trying again. You can read the details on this post. To keep this in perspective but to also illustrate the significance, regulator do fail. They freeze up, or simply stop working from all suppliers – Summit Oxygen, Top Out and Poisk. This is why quality, experienced teams will always carry spares – many in fact for large teams. But they don’t double up on this critical part because each one weighs 8.47 ounces/240 grams – that’s heavy at 8,000 meters!! In my experiences over 16 years, a failure of this magnitude is an extremely rare event – unheard of. I have used SO several times, including on Manaslu and K2 with complete success so this was a frightening shock. There were two deaths this week. 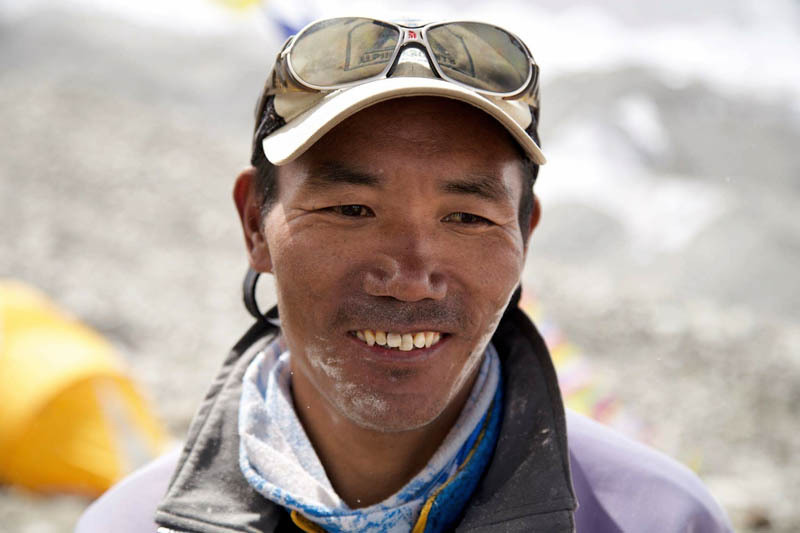 First, Lam Babu Sherpa from Kurima solukhambu working for Seven Summits Treks and supporting a Ukraine team. Details Russian climber Rustem Amirov died from AMS after nearly summiting Lhotse Details. Both tragic for friends, family and fellow climbers and from the information available, both were preventable. I say this not to be critical or insensitive but as a case study for future climbers. I received message regarding Rustem saying he was a strong climber and one friend added, “I learned during the day that he was in a “hurry”, which is very far from the Rustem I knew. I wish I knew what went through his mind.” Bashinformation Russia provides a report but I’m told first hand from people who knew him and spoke with him at base camp that he had only made one acclimatization rotation, was climbing without a teammate or support and was not using supplemental oxygen. He collapsed about 328’/100m from Lhotse’s summit, 8,516 m/27,940′ in the gulley. Sherpas found him and helped him down to camp 2 where he unfortunately passed away. He was on a large group permit with Nepal company, Monterosa, and intended to climb unsupported. Lam Babu Sherpa is a very confusing case. He was supporting a Ukraine team. 4Sport.ua has an account with very different themes. One of the climbers with Lam wrote a report but using Google translate is difficult to decipher exactly what happened. I confirmed the events the day of the death with Gyanendra Shrestha, the Ministry’s representative at EBC who said he had snow blindness, went “missing” and the rescue team stationed at Camp 2 was unaware of the incident as it was happening. I find it hard to understand how the 45 year-old Sherpa developed snow blindness, was reported to be staggering and no one was able to help him. I look forward to obtaining more details on this sad event. Speaking this week with Dan Richards, CEO of Global Rescue, probably the largest evacuation company for Everest he told me they were conducting two to three evacuations a day and have over 60 this season. More on my conversation later next week. With all this drama and tragedy, it was actually one of the most successful and safest weeks on Everest in many years. You can review all the summits to date by number on the Location Table and click on the links to the team site that in some cases show the names of the members and Sherpa who summited. In almost all cases it was a 1:1 member to support ratio. I list some of the big teams along with the number of members plus guides and Sherpa who summited: The total number are my estimates. And in the department of overcoming obstacles, Matt Moniz and Willie Benegas had to slow down and stop because they were climbing too fast otherwise they would miss the sunrise!!!! he messaged “We went way too fast, we are burrowed in at south summit waiting for the sun inr.ch/5CEYVJJ – Matt Moniz” They waited an hour for sunrise and summited per Matt’s Tracker at 4:49 am. They are off to Lhotse for a summit on 21st. Lhakpa Sherpa, 44, set the female record for summits, 9 on 16 May 2018. Hillary Slope – Don’t Talk About IT!!!!! Last week, I made a post about the Hillary Step asking “It remains to be seen what condition the Hillary Step is in, or if in fact it has become the Hillary Slope?”. The key feature on the Nepal side of Everest named after Sir Edmound Hillary, is a rock crack between two huge boulders about 12 meters, 39 feet high at 28,839’/8,790m feet just above the South Summit and 200’/60m below the summit that has traditionally slowed everyone going up and down. The question is/was it still there after the 2015 earthquake. I’ve just been informed that apparently we’re not supposed to be talking about the Hillary step. I guess they have been telling westerners in the ministry briefing not to talk to the media about it. That has to be the most ridiculous thing I’ve heard out of the ministry. I can say quite definitively that the “Hillary Step” is gone. 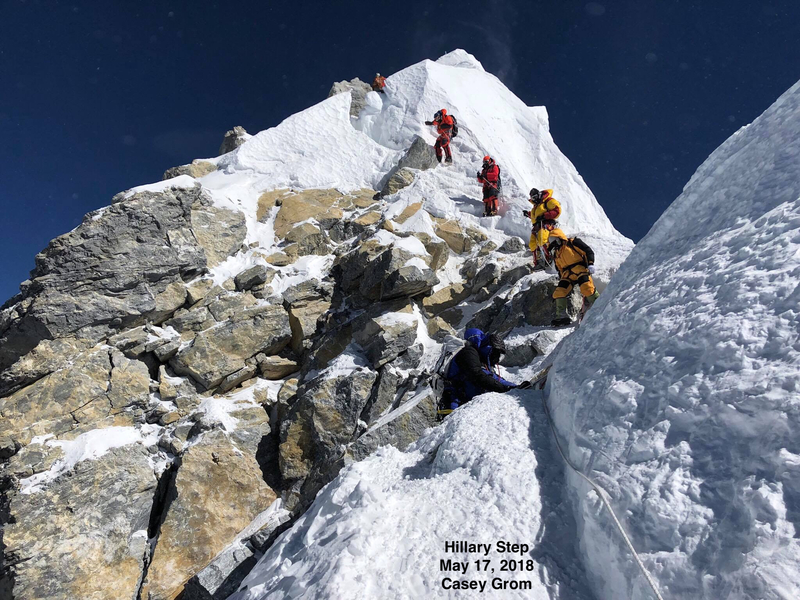 What we knew as the Hillary Step in recent years, a loose rock feature that created a pronounced obstacle that climbers needed to scale to attain the summit ridge, is now gone. On all of my multiple summits prior to the earthquake in 2015, regardless of snow conditions, we were forced up a steep corner of rock and ice before climbing left over the rock itself and “cowboy-ing” (straddling) the top of the rock. We then traversed further left to an easier ledge, then up the snow above. With similar snow conditions after the earthquake in 2016 it was obvious that this feature was gone. All that remained was a moderate (40 degree) snow slope on the ridge proper. I specifically looked at where the rock had been and saw nothing but a snow pillow filling the void. This begs the question, what do we call it now? The “Hillary Slope?” The “Hillary Slide?” Only time will tell. It would be hard to call it a “step” as the main obstacle impeding progress to the summit is no longer there. It’s unfortunate to lose such an iconic part of the route but I feel it will ultimately make the climb safer. Hopefully, I can get a clear, focused high-quality picture from 2018 to share with all. Update – received this from Mike Hamill. Casey Grom took on 17 May, 2018 – The Hillary “Staircase”? There were summits, disappointments and amazing stories of survival on the rest of the 8000 meter peaks across Nepal and Tibet last week. Lhotse – Summits, Summits and more Summits! Last week I estimate over 50 Lhotse summits thus far. There are 88 climbers for Lhotse this season. More summits of what is often considered the “achievable” 8000 meter peak. A team from Germany pulled it off this week. Earlier this month, Alpenglow started their season with summits and Rolfe Oostra with 360 Expeditions also summited. Not to be left out, Bulgarian Atanas Skatov summited with no Os. Me and Pasang Sherpa left camp 4 at 7500 meters for our Makalu summit attempt May 14. We passed the French couloir and climbed over 8000 meters, just having 4 hours to summit when snow and complete white out ended our summit chances. We were the last persons on that altitude. Returning to camp 4 I was hit by snow blindess and could not open my eyes. As the rescue helicopter could not get that high I had to rapell down eyes blind and closed from camp 4 at 7500 meters to camp 2 at 6600 meters, covering some of the hardest parts at Makalu with blue ice, rocks and snow almost vertical at times. I fell fully into a crevasse as I had to jump over it without seeing but managed to get up. When we were sitting without tent at about 7000 meters and got the message that heli could not come due to bad weather there was no choice but to continue down. I made some great learnings about inner capacity, navigating with inner eyes, changing gear to inner focus and intuition and how the body and mind can run on full adrenalin when you thought you run out of resources. When crying makes your eyes hurt like fire you need to use other means to move ahead. You have more energy than can imagine. Thank you Pasang for guiding me down and for your patience. After three days attempts the helicopter manged to pick me up, hanging flying in a rope from camp 2 at 6600 meters to ABC at 5700 meters. Seven Summits Treks said 8 Indian climbers summited. Its now reported Seven Summits Treks made a mistake and there were no summits of the team. I find this disturbing that such a report was made in the first place suggesting that Seven Summits places “victory and PR” over safety and accuracy. Carlos Soria had dropped out two days ago and my dear friend Ryan Kushner and his team turned back at 25,000’/7620m due extreme cold with low windchills. The summit is 26,794’/8,167m. Poor weather stopped most of the teams. Israeli climber Nadav Ben Yehuda – נדב בן יהודה fell and spent the night alone, unable to move or call for help. Other climbers noticed him missing and sighted his body at the base of a 140’/42m fall. They were able to move him to 6,700 meters to where a helicopter retrieved him. He is now in Kathmandu. Maya Sherpa didn’t summit but Chris Burke did and tells the story of Nadav in vivid detail on her blog. On 20 May, Asian Trekking has success on Kanchenjunga with 11 climbers from India including Harshad Rao and Arjun Vajpai along with 14 Sherpas. See all there names here. Korean climber Hongbin Kim with four Sherpas from Seven Summits Treks summited on 13 May. The Chinese “closed” Shisha after an unsuccessful search for missing climber, Boyan Petrov. A team of Chinese climbers searched on the ground and helicopters from Nepal did several air searches. They found his tents and some personal items but not him. The team of Dávid Klein and Varga Csaba tried to summit but gave up after more bad weather hit. Over on Manaslu, a Swiss team abandoned their effort due to avalanche conditions. 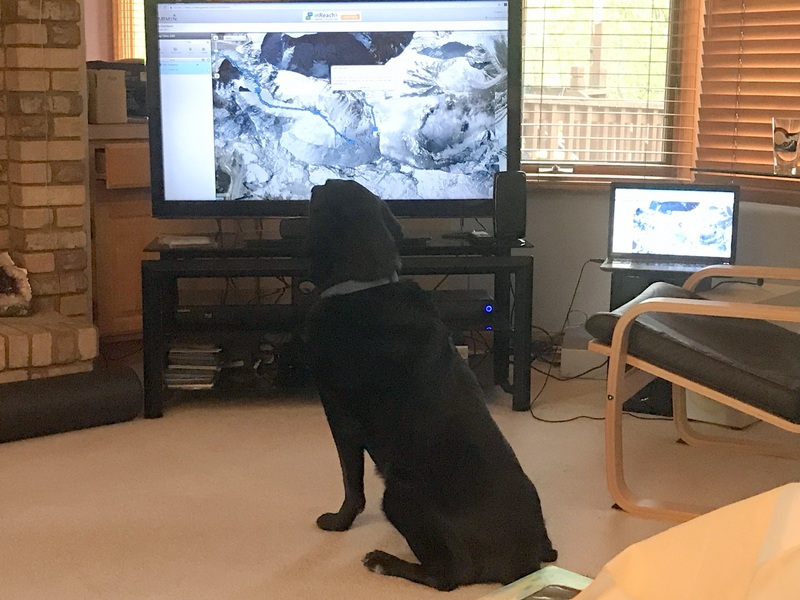 Jake the Wonder Dog, watching Jim Davidson summit in 2017. Christine, 84 years young came up to me after a recent talk I gave on my K2 summit in 2014, both a success and an epic. “I don’t understand.” She said shaking her head in a bit of disapproval. I simply replied, “I understand that you don’t understand.” With that, I expect only a handful of my readers to understand this post. You summit the mountain of your dreams. You did it in style with great friends or teammates. Everything was perfect. You come home excited, full of energy and then it hits … your emotions drop like a rock in a still pond. All ambition is gone. You mope around like you just lost your dog. At first you chalk it up to being tired, after all you trained for a year, pushed yourself to reach the summit, and back. You are tired. But something else is going on. You are depressed, not a just a bit, you are really down. You come home and friends, families, strangers, the family dog are thrilled to see you and heartfelt congratulations are offered, drinks are on the house. Just as you get ready to talk about your proud achievement, all the drama, how you dug deep, the personal life lessons you learned, your audience turns the table on you. “Great job. You must be so happy to get this one done. So, what’s next?” And so it begins. Of course you have pondered this question and have some ideas, but you want to take some time to reflect on the last climb before thinking about the next one. The last year has been all about your goal. You made sacrifices. So did your family. Your closest friends grew accustomed that the ‘climb’ was all you wanted to talk about. You denied it had become an obsession, but everyone else said it was. And now it was gone. You have a huge hole in your life. Instead of celebrating your success, you are drawn into the “no future goal abyss”. Trying to explain it is futile, no one understands except for a few fellow climbers, your friend, your partner. Perhaps the easiest and the hardest of our three scenarios. You have a built in excuse but you still didn’t accomplish your goal. On the flight home, you go thru the five stages of climber’s denial: 1. Pissed off 2. Dejected 3. Heavy drinking 4. Sleep 5. Planning the next climb. Everyone understands but no one wants to hear the details. Once again, you find yourself alone in climber’s depression. If you have ever climbed, rock, ice, foothills or the big ones, you know how it feels. The elation of reaching your goal, the loneliness of not. After the climb is often the toughest phase. The land of “tweens”. The time of annoying questions. Everest 2018: Summit Wave 4 – Update SUMMITS! Everest 2018: Hillary Step or Slope? Thank you for taking the time to put all this information together and for sharing it with us. Thanks for the support John.I do this to gently educate and raise funds for Alzheimer’s research. Another great post – thanks Alan. I have felt mostly relief, pride, happiness, joy and even euphoria when reaching the summit of mountains. Summiting Everest was all of that, but I also unexpectedly felt sadness with that final symbolic step onto the top and I think I know why. For almost 40 years I had dreamed of this day. For almost 40 years I had been planning and preparing and expecting. It was part of what defined me as a person. For the bulk of my life this dream had been in my “windshield”. But as I took that last step it went from my windshield to my rear view mirror and my future dream was now behind me, part of my history but not future. I felt a sense of loss, almost like one would experience by losing a distant relative or friend. It wasn’t the deep loss like you would have from a close relative but it was a loss nevertheless. It’s hard to explain but you are correct when you say it is very real. It is real and hard for others to understand. Thanks Robert for this. Exceptional piece of writing. When’s the book coming out?